Mulching the grass -- the pine straw shown here has blown out of the beds over the past couple of months. Of course, this is just the grass near one beds. A similar scene (or worse) can be seen around other beds. Sometimes I rake the pine straw back, but it just blows out again. It seems like only yesterday (even though it was actually two months ago) when I said unequivocally, loudly and proudly that Pine Straw Makes the Best Mulch. And now I will say three more words: "I Was Wrong." (I will then qualify those three words to say, "I was wrong for me. Pine straw may still make a good mulch for some people in certain situations, but it's far, far from a good solution for every landscape." So why have I changed my tune? 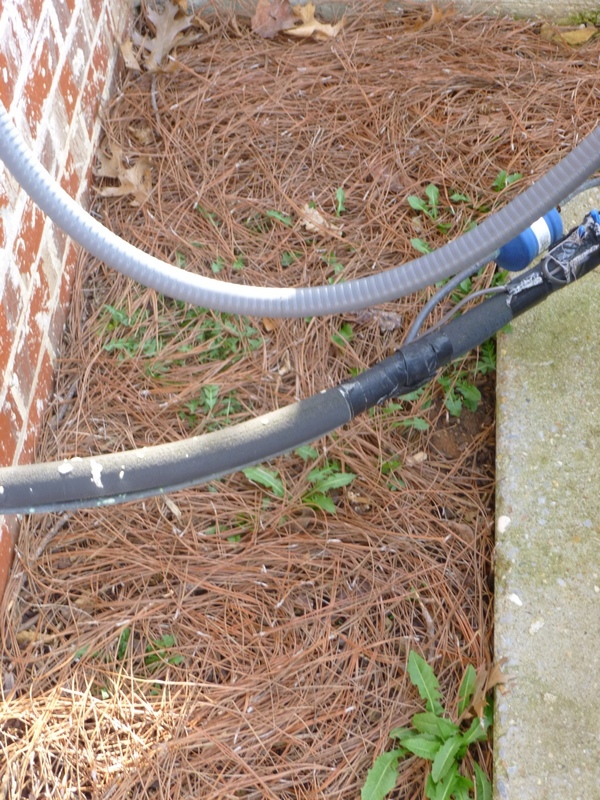 Weeds penetrating pine straw mulch with ease behind an HVAC unit. Pine straw is easier and faster to spread than other mulches - I still think this is mostly true. It is easier (since the straw is so light) and fast to spread bales of pine straw versus shoveling several cubic yards of mushroom compost (the only mulch I've tried spreading in bulk). Pine straw is less expensive - Probably still true, at least initially (read on to see what I mean by that). A bale of pine straw does cover a lot more ground than a bag of mulch, so it probably costs less than bagged mulch even though a single bale is usually more expensive than a single bag of mulch. If you buy your mulch in bulk, I can't say whether or not it's less expensive than using pine straw. Pine straw is more eco-friendly than bagged mulches - Still seems plausible, both because the pine straw is only packaged with twine (not plastic bags) and because you're not actually cutting anything down (as far as I know) to gather pine straw. Not sure of who wins the eco-friendliness contest between pine straw bales and unbagged mulch delivered in bulk. 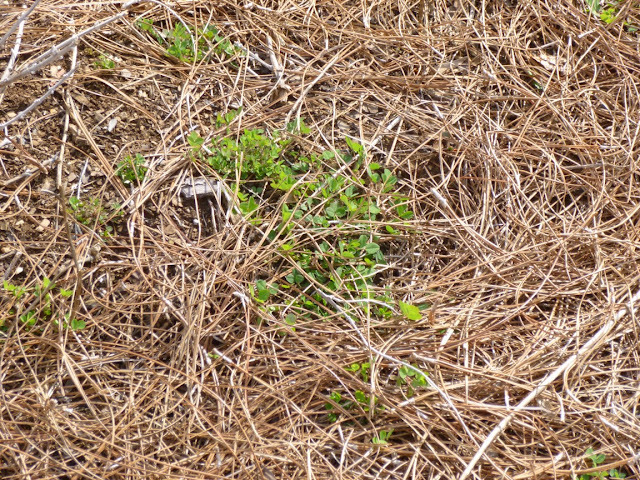 Pine straw doesn't look all that great when it is incubating a bumper crop of weeds. Pine straw looks better - Um, no. I don't think so anymore. Particularly after it has blown around a bit and has a lot of weeds growing through it (see below), I'd say I'm not that enamored with the look anymore. Pine straw is easy to rearrange - Sort of, as long as you don't mind getting poked a lot by the needles. I will say that it is easy for the wind to rearrange the pine straw for you! Pine straw stays in place when necessary - Ha! By which I mean, no, it didn't stay in place at all. So now I will proceed to eat my words (a bit painful given that pine straw is so pokey) and tell you why my love affair with pine straw ultimately proved to be a torrid but fleeting romance. A sprinkling of healthy weeds mixed in with pine straw around the base of a crape myrtle tree. Getting these weeds at the root won't be easy. You'll need to move aside the pine straw mulch first or simply grab, pull and lift a swatch of pine straw along with the weeds. Is this more pine straw that blew into the lawn? Nope, in this case you're looking at grass that has easily invaded the pine straw bed that my landscaper put down just a few months ago. Picking weeds in pine straw is not fun - The pine straw does suppress some weeds, so what's the big deal if a few weeds get through. First of all, the pine straw will inevitably poke you when you try to pull the weeds, making an unpleasant task even more unpleasant. Second, if you try to pull the weed through the pine straw, you will pull up a decent swath of pine straw in the process and disrupt the thatching of the straw that supposedly (but not really) will hold the straw in place and keep it from blowing or washing away. So you have to first move the pine straw out of the way as best you can so that you can get a clear view of the soil and have a better chance of grasping the weed near the soil surface or digging down to get the root, remove the weed and then push the pine straw back into place, knowing that it won't be long before another weed sneaks through and you have to repeat the process. I'd estimate that the pine straw probably triples (at least) the time it takes to pull a given weed. Pine straw flies like the wind - That's because pine straw flies with the wind. I was warned about this by a nursery worker last year, but I shrugged it off. Turns out he knew what he was talking about. We get some blustery weather down here. Very blustery. Like 20-30 mile per hour winds are not uncommon here, especially in the winter and spring. And this winter, we've had a couple of storms blow through with 40-60 mile per hour winds. Now I was concerned about this before buying the straw, but I decided to take a chance for two reasons: (1) our professional landscapers had used pine straw on the new beds and I figured they would be unlikely to use a mulch that had a tendency to easily blow away and (2) I had read online (and even seen photos) that pine straw could stay put in windy conditions and even in hurricanes! In any case, I did as the experts suggested and watered in the pine straw after scattering in to help it settle down and interlock, but subsequent winds still sent a good portion of the straw onto the driveway, into the lawn, piled up against shrubs that acted as windbreaks and goodness knows where else! Most likely some of my neighbors have pieces of my pine straw now! I will say that not all the pine straw flew away in each wind storm. The pine straw that the pro landscapers had laid in the front lawn seemed to stay in place much better (not perfectly, but better), so it's clear that technique can make a difference here. I think luck plays a role here too. If your pine straw has a chance to settle in for a few weeks and benefits from one or more good soaking rains that flatten and interlock the straw, it's probably far less likely to blow to the ends of the earth than if you scatter it, water it in and then have a wind storm (or succession of windy days) within the next week or two. So I'm prepared to believe that pine straw may be less prone to wind damage in some locations at some times, but I had lots of problems with it on my windy Tennessee hilltop, especially in the foundation beds. 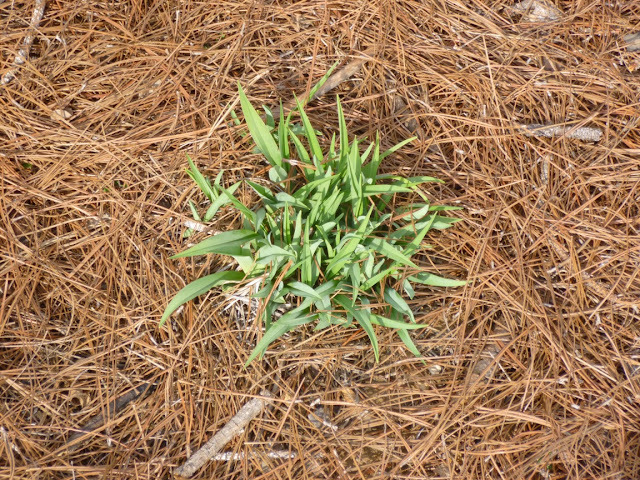 Here's a daylily growing in pine straw mulch. Notice that the pine needles are sort of embedded throughout the foliage. 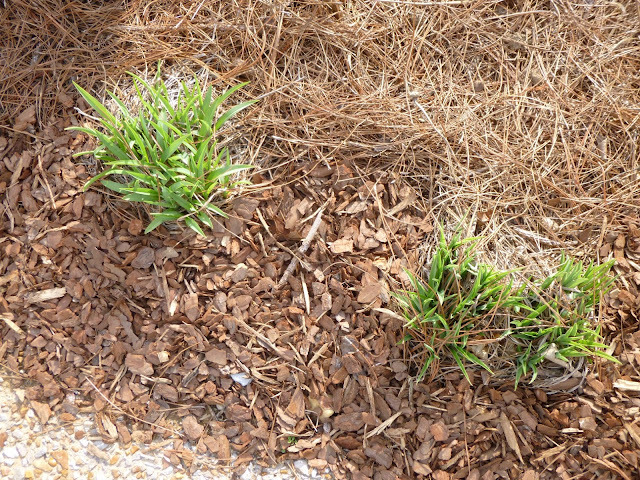 Pine straw acts like a magician with your perennials -- it makes them disappear! Months ago, when I told my landscaper I was thinking about using pine straw in my foundation beds, he warned me that the straw might be a bad idea because I had so many small perennials in the beds and the pine straw (being fluffy) could overwhelm and obscure the perennials. OK, admittedly you're not going to overlook this aquilegia plant, but it still doesn't look nice with the pine straw scattered over top of it. 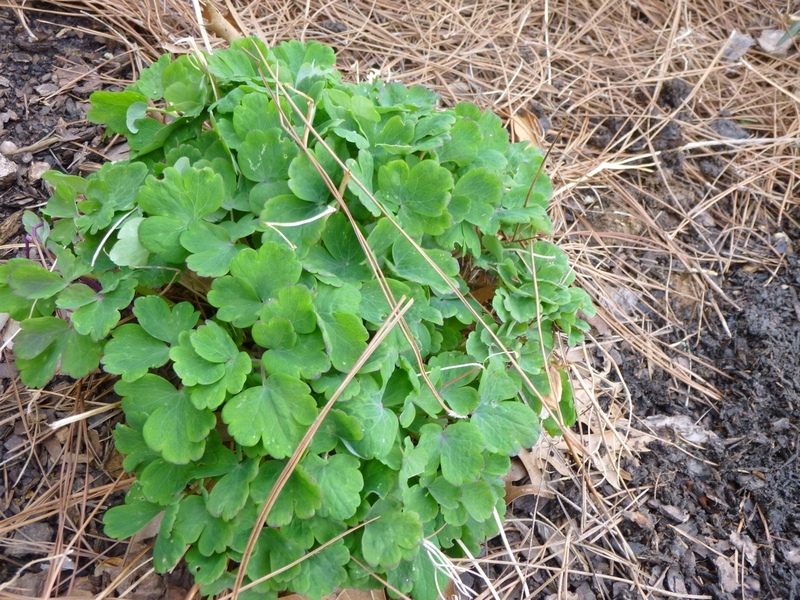 I didn't scatter the pine straw on this aquilegia - the wind did that for me. With groundcovers that go dormant like hardy blue plumbago, the pine straw makes it very difficult to even see where your perennial was, so you risk stepping on it and/or digging in that area, thereby accidentally killing or damaging your plant. With larger perennials or small shrubs, the pine straw won't kill the plant, but it will pile up against it, get tangled in the branches, and generally obscure the plant, making it look messy and less visible. In my experience, it's simply much harder to see most plants against the light-colored tangle of pine straw needles than against a darker and more uniform mulch. More pine straw tangled up in more daylilies. If not pine straw, then what?? So I had decided in despair that pine straw really wasn't working out for me after all. It wasn't blocking the weeds. It was blowing all over the place - leaving bare dirt in some places, piles of pine straw up against certain boxwoods and Indian Hawthorns and getting strewn throughout the yard. And it was hiding and diminishing the beauty of the perennials and shrubs. I had to get rid of it - or at least not make the problem any worse. But what could I use to replace it? I thought (and still think) that groundcover plants would be ideal, but they're pretty costly (a single plant can cost anywhere from $2.50 to $10) and none of the groundcovers I've tried have filled in that quickly. And I was (and am) loathe to put in any super fast-growing but invasive groundcovers like ivy or vinca. I'm still experimenting with groundcovers and have high hopes that some of them will turn out to be a good part of the long-term solution. As I've stated at least twice (this makes it three times), I'm really liking the sweet woodruff. 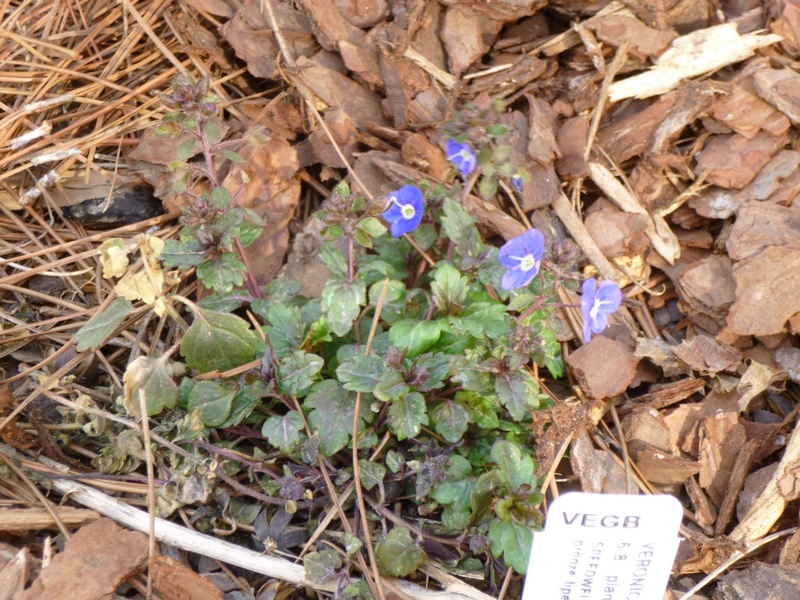 Veronica "Georgia Blue" is tiny, but seemed to survive the winter with no problems. I like that it's evergreen and I like its little blue flowers. Hopefully it will flourish and I'll be able to divide it (or buy new plants). And I've got high hopes for experimenting with sedum and ornamental ginger, perennial geraniums and more. But meanwhile, I've got to find something to cover the dirt and keep down the weeds that won't blow away, cover up the perennials and groundcovers, look awful or generally make a nuisance of itself. Could pine bark nuggets save the day? Here are some mini pine bark nuggets that I used to cover a patch of ground where the pine needle mulch had blown away. 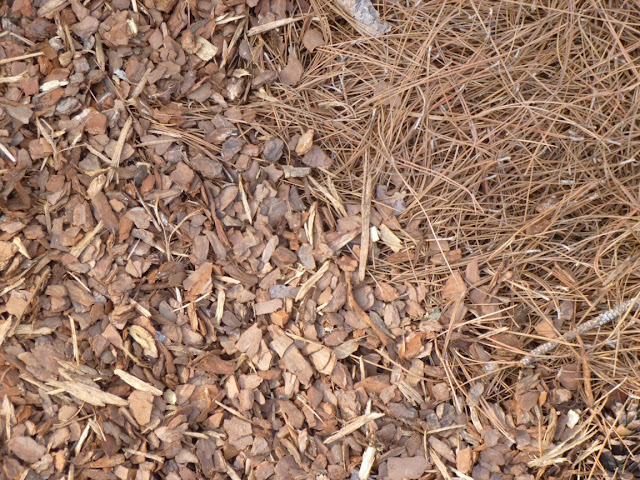 I've included some neighboring pine straw mulch to allow you to compare color and texture side-by-side. 1. I like the look. It's subjective, but I just like the nuggets. They're sort of rounded and make a nice pattern. 2. They're pretty light. Heavier than the pine straw and hopefully not so light that they'll blow away (they haven't moved noticeably yet on the couple breezy days we've had since I put them down), but probably only half as heavy as a bag of pine fines. All the pine straw blew away from this bed at the corner of the house and driveway - repeatedly. So I put down mini pine bark nuggets. So far, I'm liking the look and they've been suppressing the weeds like a champ (for a couple of days). 3. They seem chunky enough to keep down weeds. Pine straw is so fine that there are lots of places for light and weeds to keep through. Larger pieces of pine bark nugget seem broad enough to hopefully block the weeds in most places. 4. They give perennials their place in the sun (or shade). They don't swamp or cover up the perennials. Even tiny perennials like the Veronica "Georgia Blue" or the nearly-flat creeping dianthus can stand up and stand out against the pine bark nuggets. Even tiny perennials like Veronica "Georgia Blue" that would get swamped by pine straw stand out against the mini pine nuggets. I believe this is a wild geranium. (It may just be a weed.) Either way, it's standing out nicely now against some newly spread pine bark nuggets. 6. No chiggers? Janet QueenofSeaford commented on my last post by noting that she dislikes pine straw due to the fact it often contains chiggers. Also some folks have commented about snakes living in pine straw. Or voles hiding under it. (Perhaps the snakes enter the pine straw to hunt the voles?) Either way, I'm hopeful that the pine bark nuggets will harbor fewer pests. (Not that I have anything against snakes, voles or chiggers, I'd just prefer not to have any of them in my landscaped beds!) Of course, the one benefit to pine straw from a pest perspective is that it is supposedly unattractive to termites, but I was planning to purchase trap-based termite control protection this year anyway. The pine straw blew away from these daylilies on its own. So I surrounded them with mini pine bark nuggets. There are still some pine needles trapped in the daylily foliage, but I can pick those out at my leisure. 8. Less messy to spread. Wait, didn't I say that spreading pine mulch was easier than spreading say mushroom compost? Yes, but that doesn't mean it's always fun. Your mileage will definitely vary here because pine straw is not a standardized product. The quality of the straw depends on each supplier. I purchased pine straw three different times from three different suppliers and the quality was variable each time. The first batch of pine straw (from a nursery) was the best. (It was also the most expensive at more than $6 per bale!) Clean bales of good-quality and long leaf straw. I think I had maybe a few charming pine cones from all six bales, but the rest was just straw. Sadly, the next batch of bales (from a landscaping company, ~$4 per bale) were the complete opposite, filled sticks, dirt and debris. It was dusty and messy to spread. I actually wore a mask over my mouth so I wouldn't have to breathe in all the dust. And the pine needles themselves were broken and shorter than the ones in the previous batch. Frankly, if the first batch of pine straw had been as bad as the second batch, I would never have kept trying to spread pine straw mulch or written my initial ode. The third batch (from Home Depot, ~$4 per bale) was of intermediate quality. Less dirt and debris, but the needles weren't as beautiful or long as those in the first batch. 9. Much less messy to transport. Yes, I feel guilty from an ecological perspective about buying bagged mulches, but I will say that pine straw bales tend to shed their needles in the car on the trip home. Certainly not the determining factor here, but unless you have a pickup truck and can hose out the bed after the trip, you'll probably want to bring a tarp to put in the car before loading up the pine straw. And even then, count on picking out and/or vacuuming out pine needles afterwards. Callirhoe bushii (Bush's Poppy Ballow) was practically invisible in the pine straw. It pops nicely against the pine bark nuggets and seems in no danger of getting buried. So we'll see about that. At least I am only using the pine bark nuggets on a flat ground, so that will hopefully reduce the risk of them washing away, but I have a feeling that there will probably be some mulch erosion from at least one particular corner near the house and driveway. As for pine straw, I can see it having limited utility in certain specific circumstances. Wind may wreak havoc with the straw, but rain doesn't seem to faze it, so I can see it working on a hillside (as where my landscaper used it) where other mulches might wash away. (Although I should mention another hazard here that some folks mentioned to me and I've experienced myself -- pine straw gets very slippery when wet. Used on a hillside, it becomes even more hazardous. So if you do spread pine straw mulch on a hillside, I'd avoid it (or at least be very careful walking on it) after a rain. I could see pine straw also being a decent solution in a very calm environment where there were either no high winds or where there were lots of trees and shrubs to block the wind and create a sheltered microclimate. And I could see it working over a large area planted only with trees and large shrubs where there would be no concerns about perennials and smaller shrubs getting lost in the mulch. 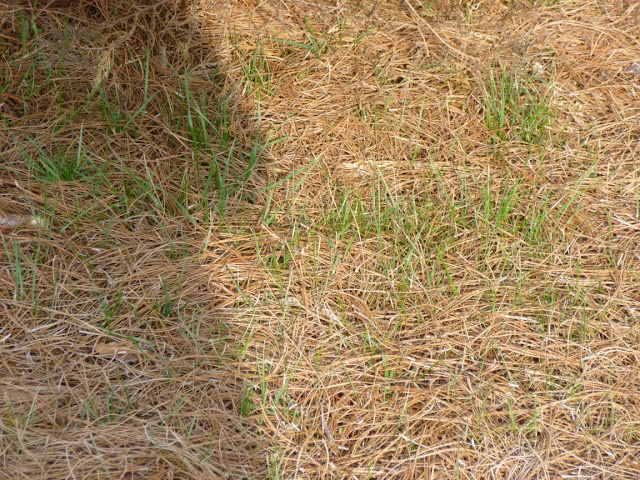 But even in those areas, it seems like weeds will creep through unless you either (a) lay a very deep and thick layer of pine straw (at which point I'd be worried about critters in the straw, fungus and water getting to the soil) or (b) use weed killer. I think my landscaper is planning on using Roundup (i.e. glyphosate) to take care of the grasses and other weeds growing in the new landscape beds, but I think you'd have to be careful not to kill any valuable plants in the pine straw and besides I hate spraying herbicides or working where they've been sprayed so that's not a good solution for me. Bringing this opus to an end, I'd like to repudiate my previous praise for pine straw. To anyone who was swayed by my earlier post to consider pine straw for their own landscape, I apologize. PS - If you'd like to stay abreast of the latest developments at Garden of Aaron, you can now subscribe via email! Totally convenient, totally free - what could be nicer? I do love a gardener who does a thorough analysis of what he's doing and learns from it, and I do love a man who starts with I Was Wrong and ends with I apologize. Thanks for this extensive and detailed review, one based in real life experience and not marketing hype! Just saying..... We are having bad mold problem in pine straw that the house builders put down in back, where no sun shines. Being one more problem to your list. Maybe you can find some nice plants that like full shade and use them to replace some of the pine straw this autumn? One thing not mentioned is artilerary fungus which you can get with pine mulch. It can play havoc with your cars and siding. Lots of rain in PA this season and major problem with this fungus. Can happen in bagged and even organic mulch. Thanks for your comment, Toodle. I was really impressed with your first post about using pine needles for mulch, as I really like how they look. So glad you have posted this follow up on the information. I just had a thought about mulch to keep the weeds down. I have used newspaper layers. If you have accesses to sand or something heavier; like perhaps the soil that you could take off the bed ... just put it back over top of the newspaper. The newspaper will, of course biodegrade over time, depending on how thick the layers are that you have put down. Thanks Maggie. I think your idea is a good one and I may very well try adding some layers of newspaper under the mulch in certain areas and holding it down with chunks of excavated clay soil! ps - Pine needles may work for you depending on your situation. If you have a less windy garden than I do and particularly if you place newspapers under the straw, perhaps it will keep the weeds down and the straw will stay where you want it? YMMV! I have successfully used newspapers too. Seem to last about 1 yr. per page. Make the cover 5 pages thick and it will last 5 years. Never had any problems from it at all and works much better for weed control than any of the mulches. I still covered mine with nuggets but just for appearance. I have used the newspaper + mulch method for about 4 years and it has cut my weeding by about 95%. I recently have been digging in the first bed I did 4 years ago and found the newspaper is gone but there are worms everywhere, loving the environment. I do pine needles in the backyard because I have a dog that will lay down in a bed and eat wood mulch until he vomits. I am in New York and NO ONE sells pine mulch up here. I really don't understand why. Black wood mulch is king around here. I used to go out in early morning hours and rake and bag them from under the trees at my office building. Believe it or not, now I order them through eBay every year and have it shipped to me. Had to laugh at your dog story. I have a French Bulldog who loved eating the red nuggets. I thought there was blood in her urine but ultrasounds turned up nothing negative inside her. Vet said just keep an eye on her so I did, and caught her outside snacking on the mulch, LOL. Hmmmmm ... I wonder if you put enough down to prevent the weeds from comming through, but if you are having issues with the winds blowing it around then it may not be best for your location. I do what Maggie suggests, except I use cardboard then the layer of pine straw. Everything is blooming here at the Rock Castle Dude Ranch! My spinach is starting to sprout! Your diagnosis may be accurate. I'm sure if I had put down 6-inches of pine straw, it would have kept more of the weeds down. (Although it would probably have smothered more of the perennials too.) And yes, if I had put down newspaper or cardboard first, I'm sure that would have helped too. Congrats on Spring arriving to your ranch! I've sowed spinach too, but less than a week ago and don't think I've seen any sprouts yet. Good gardening to ya! Hey, Aaron. Sorry you're leaving all the pine straw to me. I still love it. Perhaps because I lay it on heavily and use it selectively. Also, before spreading the pine needles, I clear out weeds and sprinkle organic weed pre-emergent, like corn gluten. Annnd, when weeds reappear, as they always will, I spray them with any number of organic weed killers, such as apple cider vinegar. Like Maggie and JT, I always cover the space with newspapers or cardboard (or biodegradable clothing, even) just before spreading pine straw. When I say I use pine straw selectively, I mean I don't cover huge swaths in my garden. In some spots I use pine bark mulch, in others, pine bark nuggets. The nuggets, as you're learning, are more stable in some places than is pine straw. I'm glad you're engaged in finding The Way. Trust me, it's a search that'll never end. As you say, the search for a perfect mulch (and certainly a perfect garden) is endless. But it's a fun journey! And as you also point out, there may be room for more than one kind of mulch in a garden. As for me, my dream is a garden with mostly groundcovers interspersed here and there with just a little mulch. Hope that Spring is starting to arrive in CT! Thanks, on spring; it's fighting its way through the snow. Soon, it'll be victorious. Time's on its side. Sounds like you've got a great system worked out. I hope to emulate it to some degree with the pine nuggets. Probably don't enough have trees (or leaves) to use them as a full mulch, but will hopefully use a combo of leaves, pine nuggets and groundcovers. Not to be a negative Nelly, hope your pine bark nuggets don't float away. Heavy rains and a slope to your yard COULD cause those nuggets to move downstream. thanks for the mention! I am so far behind in reading postings...have company for the next two weeks, doubt I will make much headway --Reader is at 95 posts in the line up right now. Hi Nelly...er, I mean Janet! I appreciate the warning, but so far I've carefully only placed the pine nuggets on the flatter parts of my yard. Which is not to say that some of them might not still blow or wash away, but hopefully they'll fare a little better than the pine needles in terms of staying put. Hi Aaron, yes it WAS really warm here for the last week, have been having the house wide open...all the sliders wide open. Went to bed last night with the bedroom slider open....woke up and the room was a bit chilly....the front you had yesterday made its way to us last night. High today is maybe 50. Glad your nugget bark is working out. I've lined my drive and sidewalks with pine straw - It does look nice, I have a lot of brick character to my home. It can move some - not all over my yard though. I really have appreciated it with all the rain we've had lately as it keeps the water back and the sand from splashing all over my walks and drive, hasn't floated away. My thoughts on the wood nuggets or anything like it is to be careful that you understand that termites and roaches like it too. Pine straw seems to have more positives than negatives for our yard in North Central Florida. Here's two websites that have information on termites and roaches in mulch http://liveoakpestcontrol.com and the information and blog posts of this one (a pine straw wholesaler http://custompinestraw.com. Hope it helps. Happy to hear that the pine straw is working for you! Couldn't tell you which type of mulch roaches prefer, but I CAN tell you that house centipedes (http://ento.psu.edu/extension/factsheets/house-centipedes) LOVE the pine straw mulch. I see them in the pine straw mulch all the time around the trees in my front yard that were professionally mulched by my landscaper. Personally, I don't have a problem with house centipedes, but they can be startling to see with their many legs and fast movements. If you check out some of my more recent posts (like this one - http://www.gardenofaaron.com/2013/07/groundcover-review-hardy-blue-plumbago.html) you can see that I'd love to get rid of most/all my mulches and replace them with groundcover plants. Instead of going to the store every year to refresh your mulch and buying something that has been bagged and trucked and harvested, you can cover the ground between your shrubs, trees and perennials with plants that will grow each year and sometimes provide extra benefits for birds, bees, butterflies, etc. Of course, nothing is perfect. The wrong groundcovers can run rampant and create more work for you to control them, but hopefully my groundcover reviews will help you to find some good plants that cover ground, keep down weeds and improve the soil structure without overwhelming your plantings. Aaron, I have been using the pine mulch for the past three years and I love it. I do apply it thickly, 3 to 4 inches deep, and I do have a rather large border around my garden. I never realized that high border was making my pine mulch behave! LOL! Over time I have also realized that any new weeds I have come out very easily because their root system has grown so close to the surface of the soil. My worst and hardest weed to control in the flower beds are violets. However, with the pine straw even they can be pulled by hand. My purpose in telling you this is not to change your mind, it obviously isn't working for you, but I did want to share that in the right application it is a very good mulch. Thanks for your comment, Lynda! I'm happy to hear that the pine straw mulch is working well for you. I definitely agree that pine straw mulch can work well for some people in some circumstances. Can I ask you a couple of questions about your garden? Do you garden in a very windy area or is your garden protected by windbreaks and natural topography? Also, do you try to grow any small perennials in the beds that are mulched with pine straw? Or are you just using the pine straw underneath shrubs and trees and such? I grow smaller bedding plants in groups or pockets, and working the pine straw in around them is tedious... so I don't bother. I feel that the smaller pockets are manageable for hand weeding. The rest of my plantings are perennials and shrubs. I wasn't sure what you meant by small perennials. The smallest are my herbs and because they grow in mats they don't get mulched at all. There are a few that grow up and right through the pine straw, monarda, iris, daylily, etc, and they do get mulched underneath. It sounds like your topography and landscape are perfect for pine straw! Hm. By small perennials, I guess I mean plants like Ajuga, Daylilies, Agastache, Geraniums, plants that only grow 1-2 feet tall at most. It sounds like you mulch some of those and let other ones - the mat-forming ones, as you say - go without mulching. your installing it way to thin. 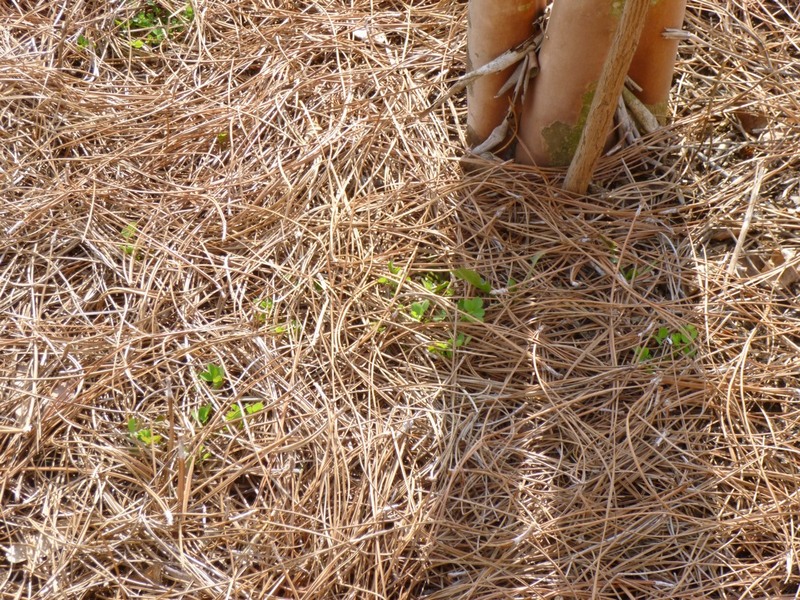 I have never seen Pine straw installed properly with weeds. Thanks for the comment, RC. I've no doubt that you're right -- thicker pine straw mulch would definitely block most if not all weeds. The places where I had a professional landscaper install a thick carpet of pine straw have fewer weeds (although some weeds and grasses *did* poke their way through). But the issue for me is that I like to have lots of perennials in my garden beds. A heavy blanket of pine straw would smother, cover or obscure many of these perennials. I do think that pine straw could potentially work in a hilly, non-windy location where you only have trees or shrubs and don't have to worry about a heavy covering of pine straw causing your perennials (or annuals) to disappear. Clearly some folks love pine straw as a mulch (and it certainly makes a lot of sense if you or your neighbors have pine trees that are shedding needles! ), it just didn't work well for me. Do you have a background in Horticulture or are you a homeowner that doesnt want to rake or pull weeds? Pile the pine straw on thick and spray a pre-emerge and it doesnt move and its weed free all year. I pine straw 30 acres a year on my golf course with minimal weed issues and the clean up is substantially easier then mulch. My education in horticulture is just through the School of Hard Knocks. I don't mind pulling some weeds. I do want to minimize weeds -- both for myself and also because I think many folks think "gardening = pulling weeds". If they knew there was a way to minimize weeds, they might be more likely to try gardening! I don't spray any chemicals in my garden really, although my landscaper does spray some pre-emergent in a few beds that he takes care of. And yes, I'm sure that if I piled on the pine straw more thickly, that would help. But then my annuals couldn't reseed and many of the smaller perennials would get smothered. There are always trade offs! He/she certainly had forceful opinions. Hi, thanks for the information. Real experiences are always better than theory. If I may add, I think each mulch has its benefits. I personally use the Pine needles for my acid lovers, the chipped wood for my flowers, the rocks for my lavender, as the bottoms need to be kept from rotting. The other disadvantage of the straw is that it attracts mice from burrowing there. I would not use too much of that when I do use it. Too much of anything is never a good thing! I think you may be right that each mulch has its place - just like each plant has its place. I do think the pine straw tends to do well and look good when it's applied thickly around the base of trees and large shrubs (particularly in not-so-windy locations). But I don't think it mixes well with annuals or perennials. Thanks for the advice. I'm learning that pine straw does work quite well in some applications (though not in beds with loads of annuals or small perennials). So I'll take your suggestions to heart if I ever end up spreading pine straw in the future! Aaron, when I moved to NC in 2010, I noticed the extensive use of pine straw. I was concerned about the fire issues as well, but also the fact that it needs constant replacing. In addition, it tends to attract snakes. This could be bad depending on your view of such reptilian guests. Now that I am back in Colorado, I never see it used. Here it is mostly river rock that people use for landscaping. There is some bark mulch used, but in our windy environment along the Front Range, it blows everywhere and makes a mess for the entire neighborhood. Sorry for the belated reply, Randy. It's funny you mention snakes because I actually encountered a little guy (Ribbon Snake?) in the pine straw mulch not too long ago. I don't mind (non-poisonous) snakes at all, but it did startle me! I don't know that I've ever seen river rock used as mulch here. Interesting how landscape choices can vary so much from one region to the next. It certainly does seem like it would cut down on the blowing mulch problem - plus of course you don't have to worry about it decomposing in your lifetime. On the other hand...from what I've read, rock mulch is heavy and you still have to worry about weeds growing among the rocks. I'm coming to the conclusion that the best mulch is living plants. Not sure what would work best in that category in Colorado, but here in TN, I'm experimenting and learning from plants such as Creeping Raspberry, Creeping Germander, Lambs Ear (Helene von Stein), Creeping Veronica, etc. I live in southwest Arkansas...pine country. Growing up I was used to people using pine straw to mulch around their plants. If they didn't have pines growing in the yard, they had pines near the yard and that meant free mulch. However, in this area there are two problems: copperheads (snakes) and seed ticks. Having come home with ticks all over after walking in piney areas and also having come upon several copperheads in areas of pine around the house, I'm hesitant of using pine straw near the house (we also have to watch for the copperheads near the house too, pine straw would just add more camouflage for them). I've been using natural color hardwood much and today for the first time bought what was supposed to be pine bark nuggets (which turned out to be about 60% large chunks of bark). When I sift out the larger chunks of bark and break up what I can of those, it's pretty good stuff around the roses. The hardwood has been good at holding in soil moisture and keeping the ground cool underneath. I'd probably go for whichever is the easiest and cheapest to get in your area. Thanks for the comment. I've used pine bark mulch in recent years and have been fairly happy with it. BUT (as I wrote in my comment above), I do think these days that the best mulch is living groundcover plants. If you find the right plants, they will thrive year after year -- saving you time and money that would have to go toward replenishing mulch annually. Plus plants seem far more eco-friendly than mulch which has to be cut/shredded somewhere, bagged, transported and so forth. Stumbled across this as I was searching for online pine straw websites. Maybe I have missed this in the comments, but one thing gardeners should keep in mind with pine straw is that it is acidic. Ever notice how nothing grows under a white pine tree? It is because the combination of shade and straw acidity effectively deters most weeds. But you are right. The straw must be very, very thick to prevent weeds if not shaded. Pine straw is very good for plants like blueberries, blackberries, raspberries, likely azaleas, etc. Pretty much anything that requires a slightly acidic soil because the acid leaches into the ground. I would recommend using pine straw mulch, but then covering it with a layer of cedar. Gives the best of both worlds, but it does depend on what one wants to accomplish. 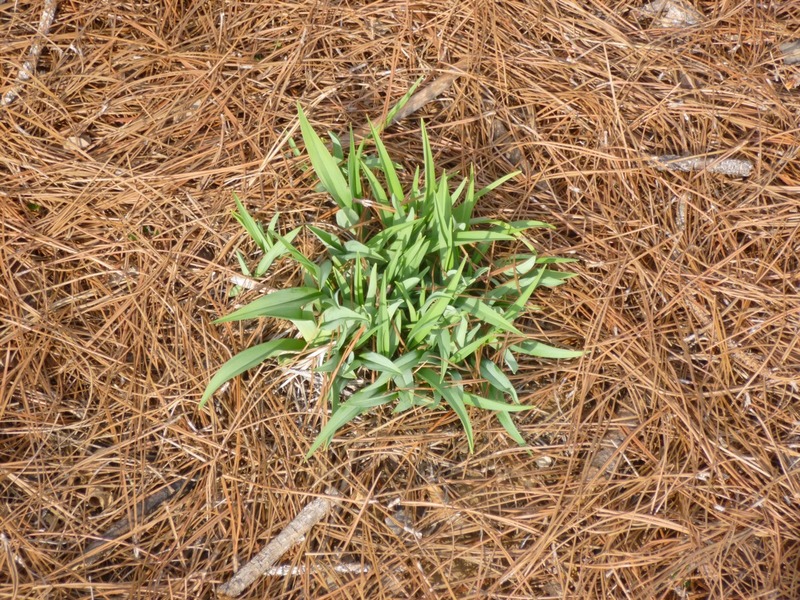 I'm no expert on the topic, but from what I've read (e.g., http://anevidencebasedgardener.wordpress.com/2011/01/25/mulching-with-pine-needles/) pine straw probably has only a very small impact on decreasing soil pH (i.e., making soil more acidic). If you already like pine straw as a mulch, this might make you slightly more inclined to use it on plants - like the ones you've mentioned - that prefer acidic soil. But if you have neutral soil and grow the type of plants that prefer that soil, personally I wouldn't worry about pine straw throwing my soil pH out of whack. I suspect the shade and the constant shower of pine needles does more to deter weeds than the soil pH beneath a pine tree. But again, I'm no expert on that topic. Don't even have any pine trees in my yard! As I wrote to another recent comment on the topic, I suspect that living plants - groundcovers - make the best mulch in the long-run. But of course the challenge is to find a groundcover that suppresses weeds without taking over an entire garden bed or spreading into wild areas (unless it is a native to those areas). I live near Yosemite and I have a large container garden: trees, roses, shrubs, and perennials. Since pine needles are in great abundance here, I was wondering if I could use pine needles for a mulch in my containers? Has anyone every used pine needles for containers. I live at 3,000ft elevation and we do get some snow. I think it should work OK, Anon. Why not give it a try and let us know how it works out? The pine straw should have been installed at a minimum of 3". It would be appropriate to install 5-6" during the initial installation and touch up yearly. 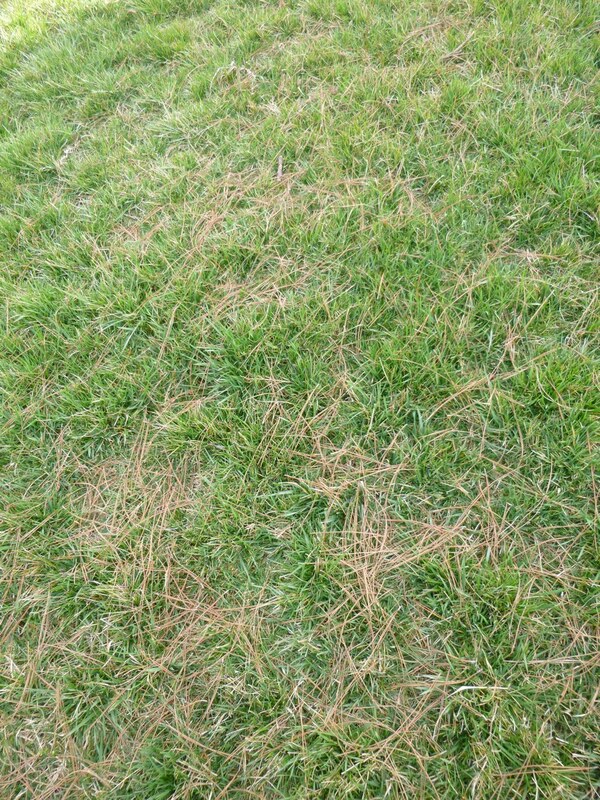 If that is how your pine straw looks after three months it was not installed correctly and was poor quality straw. It should matte down to the point where a landscaper could take a leaf blower to it to remove fallen leaves that may have landed on it. A leaf blower is going to be much stronger than any wind you may see. You should also carve or roll the straw around your flowers. Natural red oak mulch would be another good option that controls weeds and stays in place. Pine bark nuggets or dyed mulch will not stay in place in windy, sloped or heavy rain conditions. Natural red oak may be the best of both worlds for you but you will have to find a landscaping whole sale yard because the big box stores (all of them) are overpriced and lower quality. Thanks for the suggestion, Anon. I'm sure you're right that deeper, thicker pine straw mulch would do a better job of holding down weeks and stay in place better to boot. Unfortunately, 5-6 inches of pine straw mulch would probably smother or overwhelm many of my perennials. So like I said, I think pine straw mulch is only a good option if you're just planning to have shrubs and trees in a landscape bed. So what about on a slope where you want to have a mixture of trees, shrubs and perennials? I'm not sure. Maybe pine straw while the shrubs and trees get established enough to provide some erosion control, then add in a lot of perennials and groundcovers all at once to replace the mulch. I'm still figuring it out! I thought that pine straw might be a good solution to our problem - but after seeing the posts mentioning snakes I'm having second thoughts. We have a pretty good slope behind out house that leads to a creek that feeds into a lake. The slope is wooded but we have weeds and grass growing and the area is very hard to manage. The slope is too steep to drive the lawnmower and we end up using the weed-wacker which is very labor and time intensive. I would like a natural look that is easy to maintain but am unsure what to do. But since we are in the woods and have water nearby I don't want to encourage snakes since we already have seen them on occasion. Any suggestions for ground cover? Hm. If you're not planning to walk on it much, I can think of a few shade-tolerant groundcovers. You don't mention where you live (i.e. which USDA or Sunset Zone), so the recommendations would vary depending on whether you're in Georgia, California or Maine. I think Hellebores would also work for you. If you try something, please come back and let us know how it works out! Enjoyed reading of your experiences with pine straw. I decided to use it to mulch some new tulip and daffodil beds I had planted this fall. In the past I had used the bagged pine bark mulch over newspapers but had read that the downside of that was that the nuggets tend to deplete the soil of nutrients as they decompose. For some reason, pine straw is not available here in Connecticut so I just raked some needles from under some pine trees I had planted here years ago, spread them over the newly planted areas, watered them down pretty well, and then lay some pine and spruce branches I had recently trimmed, on top of the needles. We've had some pretty gusty winds, 30-40 knots, around here this fall and so far everything seems to be staying in place. The plan is to shake off any loose needles, remove the branches, and sprinkle some powdered lime over the beds in the spring to neutralize any acid from the decomposed needles. An unintended (but positive) consequence of laying the branches over the beds is that it seems to discourage my three little French bulldogs from "fertilizing" them. I've also noticed that very little (other than ivy, of course) seems to grow under the evergreens. I'm not sure if this is because of the mulching effect of the needles or simply a lack of sunlight. Sounds like you did a great job, Richard! I think part of your success may have come from laying the pine and spruce branches/boughs on top of the pine straw to hold everything in place. I'll be interested to hear how you like the effect of the tulips and daffodils coming up through the pine straw in the spring. Thank you so much for your post. Love your analytical approach. I can't imagine how you had so many problems with pine straw, operator error maybe? I'll be watching for your next article titled "I was wrong, I was right the first time " because I have no doubt you will quickly come to detest mini pine bark nuggets. You have to weed with any mulch sir, it's not magic and weeds don't disappear. Pine straw is the only mulch (other than rocks) that doesn't wash away with heavy rains. If your pine straw is blowing out of your flower beds, mister you better head to the storm pit and not look back. I'm a huge fan of pine straw mulch obviously and I think you will be too with a little more age and experience. Happy gardening! Thanks for your comment, Anon! I think you're probably right that some of my problem was operator error. I almost surely didn't spread the pine straw deep enough, which let the weeds creep through. But I still think pine straw is an awful choice for an area with lots of little perennials. And if you have a large area to cover with deep pine straw, well...let's just say that I still think living mulches (herbaceous and/or woody groundcovers) are the best option. "As for pine straw, I can see it having limited utility in certain specific circumstances. Wind may wreak havoc with the straw, but rain doesn't seem to faze it, so I can see it working on a hillside (as where my landscaper used it) where other mulches might wash away. (Although I should mention another hazard here that some folks mentioned to me and I've experienced myself -- pine straw gets very slippery when wet. Used on a hillside, it becomes even more hazardous. So if you do spread pine straw mulch on a hillside, I'd avoid it (or at least be very careful walking on it) after a rain. And I could see it working over a large area planted only with trees and large shrubs where there would be no concerns about perennials and smaller shrubs getting lost in the mulch." Living in an area of southwest Arkansas where there is a problem with Copperhead snakes, I've been very hesitant about using pine straw for mulch (I remember when young almost stepping on one that was lying on top of pine straw...it blended in too well). I've been using pine nuggets and haven't had any problems so far. A shame since we have pines all around the property so pine straw would be free for the raking). I too have noticed problems before with chiggers and small ticks in pine stands, another problem you don't have with the bark. Pros and Cons for everything I guess. I might use pine straw in areas I don't have to regularly maintain such as some crepe myrtles along our long drive to the house. About the scariest things I've encountered in pine straw are centipedes. Happy to hear that pine nuggets are working out for you. It's still my favorite mulch, although once again I'll say that I think groundcover plants are the best (living) mulch -- if you can find the right plant for your place! The pine straw in this review was not installed correctly, it was spread way to thin. 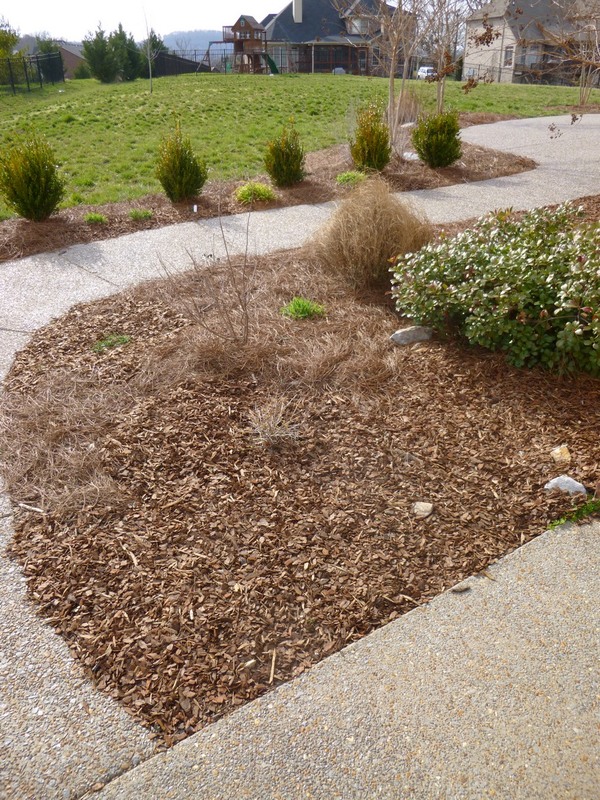 If pine nuggets or any other type of mulch were put down as sparsely as the pine straw in this example, it would not prevent weeds or stay in place either, it would be prone to wash away in rain. I use a leaf blower to blow leaves from the pine straw in my natural areas, and the pine straw stays put. And, more so than any other type of mulch, pine straw resists washing away in areas affected by heavy rains. If you're going to give a review on something, review something you are knowledgeable on. Thanks for your comment, Westone. The review is simply of my experience putting down pinestraw. As I've said in response to some of the other comments, others may get different results by putting down pinestraw differently - more thickly, having it professionally installed, using it in a less-exposed area where it might not be buffeted by high winds, etc. I have installed plenty of pine bark nuggets and in my experience, they are far less likely to blow away and do a much better job suppressing weeds, even if laid down sparsely. Now it is true - again as I've said in response to other comments - that if you put down a thick interlocking layer of pine straw, it will do a good job of suppressing weeds. But it will also overwhelm most small perennials, so it's only really suitable (IMHO) for being used around shrubs and trees. Pine straw also seems to break down much more quickly than the pine bark nuggets. 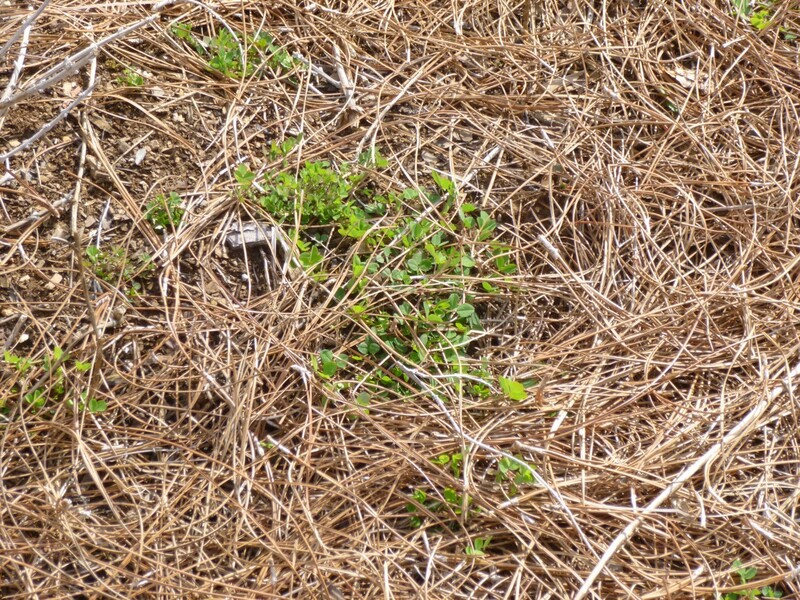 And if weeds do get through pine straw -- and at least a few seem to get through even the thick pine straw after a while, they are a PITA to pull, because they are so intertwined with the pine straw, that you end up pulling up a big patch of pinestraw in the process. The best mulch by far, IMHO, would be a green living mulch - groundcover plants, perennials, annuals, even shrubs. That's what I'm working toward on my own property. It takes more time and money to get it started, but I think it's lower cost, less effort, more beautiful and offers far more ecological benefits in the long run. PS - I do still use pine straw - for now - on one steep hill, but again, I hope eventually to have groundcovers replace most if not all the pine straw in that area. But that will take some time to accomplish. An obliging neighbor permitted me to collect some of their long pine needles (don't know what species). I laid it 3-4inches thick. Occasional weeds try to grow, but when I pull them out some of their roots weren't even all the way down to the soil, so it's easy to go around & pick them out. Most of my property has evergreens (a creeping juniper is my front "lawn" approx 40' x 10', Some 25-30 arborvitaes & a couple of hollys), w/some perrenials stashed here & there. Originally I sought the pine needles to mulch my raspberries & blueberries, which I'm quite happy with. Also, I have 9-10 different thyme species, which are doing very well nestled in the pine needles. I'm planning to advertise in my neighborhood for more obliging neighbors to let me take away their unwanted long pine needles. Thank you for this site -it's been very informative! I must admit I'm a little surprised to hear the thyme is OK among the pine needles. Presumably it's not creeping thyme? Yes, creeping Thymes including: elfin, woolly, pink chintz, highland cream (this one's not as happy as the others, but it was that way before I added the pine needles), red and white creeping thymes, in addition to a few culinaries -Silver, English & something else I can't remember the name of. Also, re: the pine needles: Seems like regular bark mulch comes in neon black or that bright burnt orange color -both of which I find a little garish. & it's not like no needles are ever out of place, but they seem to stay put much better when thickly laid -maybe the needles tend to interlock more when the layer is thicker...? Super windy weather hasn't been a problem. I agree that spreading the pine needles thickly certainly seems to help keep them in place. I must admit that I can't quite picture how the thick pine straw works alongside creeping thyme which is only a few inches tall. Doesn't the thyme get swamped (or at least obscured) by the pine straw? I prefer cypress mulch It lasts a lot longer Stays tight and close to the ground for weed control.Plants can grow easily around it. I like the natural color, but (1) All I have seen at big box stores lately is "cypress blend" how much is just shredded pine is a mystery. (2) I can't find natural. Colored is ugly. Bags are easy to handle and dump. I recycle mine. I save cereal boxes and other cardboard and put it down first, then wood chips from a birch and maple tree that were dropped off by a tree cutting service ( they have to pay a landfill to take it). My neighbor does this and she said it really keeps down the weeds. After reading several articles about pine needles as mulch I used it as the bottom layer before the wood chips. I just tried this on one side of the house this week so I will find out if it works. This is the first year I remember so many pine needles being in our yard. Your method sounds good. In fact, it sounds a little like 'lasagna' mulching (layers of different materials). Do you eventually try to plant in these areas after the cardboard has broken down? Or do you just use these methods in areas where you're planning to mulch indefinitely? Hope you find a better groundcover solution for your pond. In the long run, I think that low-growing plants make a better and more wildlife-friendly groundcover than any type of mulch. I gave up on both pine straw and pine nuggets and for several years have been using Hardwood Bark Mulch for both a garden and landscape mulch. You can buy this mulch in either bulk of bags, it spreads easily, suppresses weeds and slowly decomposes to provide a soil conditioner. I put down a 3 to 4 inch thick spread of mulch to begin with for a good base and then only top dress it with about 1 inch of mulch in subsequent years. It looks good and stays in place. Thanks for the suggestion, Dave. I'm not averse to trying hardwood bark mulch, although in the long run, my hope/plan would be to cover much of my landscape with groundcovers (either true herbaceous groundcovers or shrubs that function as groundcovers). From what I could tell, it looks like you didn't put it down thick enough. It must be at least 6"thick or more. Also to keep it from blowing, wet it down thoroughly (I mean a lot). Yes, some things will come through, but at least you can pull the root out. The mulch is so hard that things break off. Thanks for the advice, Ginger. I suspect you're right - DEEP pine straw that is thoroughly watered should do a good job of blocking weeds. I do think the necessary depth makes it difficult to use pine straw in a bed where you want to have perennials and annuals, but if you're just landscaping with trees and shrubs, lots of pine straw can probably make a pretty effective weed barrier. I live in a windy high desert area where pine trees do well as wind breaks and I have a surplus of pine straw I need to spread out to reduce the fire danger. I skim off small clumps with a pitch fork keeping in its original knitted condition with a little space between each clump when placed on bare soil as a mulch. Doesn't blow away and I let nature do the rest. I sometimes irrigate with a sprinkler which increases decomposition resulting in a nice rich humus underneath. Free and easy. Sounds like you've found a solution that works well for you. Do you just use the pine mulch under trees and shrubs or do you try to use it as a mulch among perennials? I haven't had the annual 60 mph Santa Ana winds yet this year. I need to spread the pine needles anyway for fire safety and it all stays on site doing good building soil and sequestering carbon. The small clumps seem to stick to the rough exposed decomposed granite. I place it in openings and around perennials for soil erosion, temperature and moisture control. I noticed that in time roots under the pine mulch grow closer to the surface and if irrigated I get a lot of decomposition under the pine mulch. I would leave needles under the pines except for the fire hazard which is me possibly starting a wildfire when I burn tree trimmings outside. Hi Aaron - I'm in New Zealand & I live on a flat inner city quarter acre section. I have ornamentals, fruit trees & a huge vegie garden. I have mulched with both pine bark nuggets and pine needles, and prefer needles for a number of reasons. We have little rain here on the East Coast & rain does not penetrate through bark nuggets. I lost a number of roses even though I watered regularly, but the water didn't get thru unbeknownst to me until it was too late. Pine needles are perfect in that regard. I have used pine needles on my strawberry bed with huge benefits. Lately I have found that using it thickly as a mulch in my greenhouse has suppressed the fungus gnat - a pesky little critter that lays its eggs in damp soil. The maggots eat the roots of my precious seedlings - but not any more!. The flies can't get in to lay their eggs, & perhaps are deterred by the smell of the pine needles. What ever the reason, they have been significantly reduced. I'm not too fussed about weeds, as my outside garden is chocka with perennials, annuals, bulbs & other bits the birds drop off but it was good reading other people's suggestions in this area. It sounds like the pine straw is a good option in your climate. Interesting info about how you think rain filters through pine straw but gets blocked by mulch. 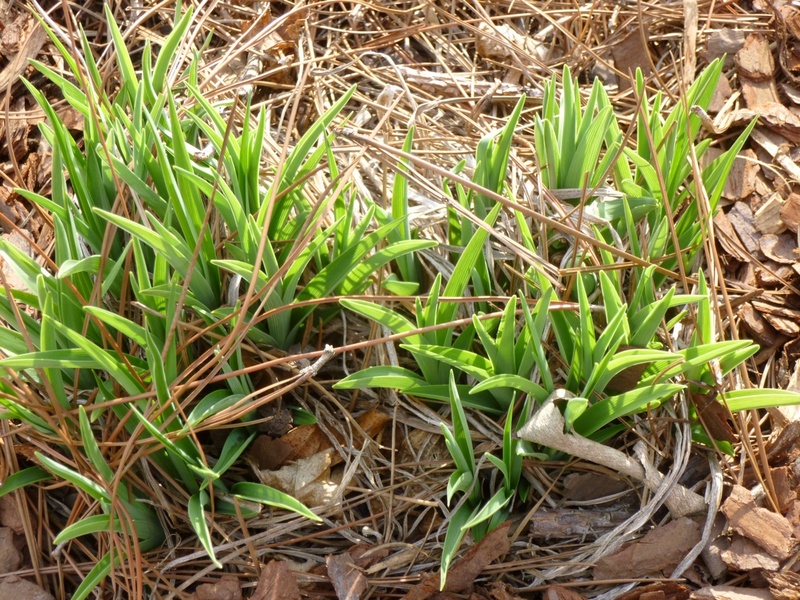 Question -- How do you manage the pine straw among the perennials, annuals and bulbs? Or do you just use it in certain beds (e.g., beneath the roses, the strawberries and in the greenhouse)? The pine needles are spread on the flower borders at during late Summer/Autumn when the flowers etc start to die back, but first I spread a layer of compost, (which we make ourselves). I just leave the garden to do its winter thing. Same with the vegie garden. 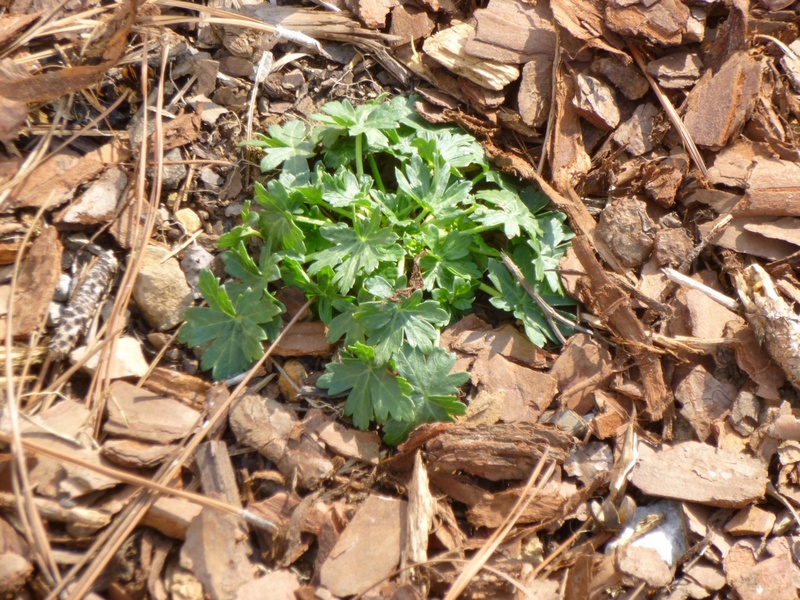 Come the Spring, many seedlings push through the pine straw, which include self-sown annuals and weeds, too. There may also be stray pumpkin and tomato seedlings from the compost! I give all weeds the benefit of the doubt until they are recognisable, and then either pull them out or transfer the rogue vegetables to the vegie plot. All seedlings are so easy to pull out at this stage due to very shallow root systems thanks to the pine straw. I have a lot of annuals popping up that I haven't even planted, and this year a new double white daffodil has appeared. I put this down to never digging over my garden. I never ever dig anywhere, except to change the compost in the greenhouse. In late winter, over in the vegie plot, I spread another layer of compost and top it with another layer of pine straw. The garden has been mostly resting over the winter months and is now ready for Spring planting. Some annuals have usually found their way over to the vegie plot which is absolutely wonderful! Pansies in the parsnips is just fine by me. They attract bees and look so cute nodding their wee heads amongst all that greenery. So pretty much pine straw has found its way all over my garden, but I am so pleased with how it works in the greenhouse. I haven't read anywhere that it suppresses the dratted fungus gnat, but I'm sure it has. I'm thrilled to have discovered this free, plentiful, organic and sustainable resource. I do have some photos, but I can't see how to attach them here. I need to keep up my own blog - am too busy gardening though! This might be how do it! After you have added your text, click on the Save Settings button on the top right corner. And you're done! Hm. Sorry it's such a hassle. On recent posts (like http://www.gardenofaaron.com/2016/09/doomed-caterpillars.html), I now use a comment management system called IntenseDebate. If your images are online and you can just post the URL, I'm happy to click the link and visit your Flickr or Google Drive account (or wherever they're posted). This is an area of one of the vegetable beds which has been planted out and mulched with pine needles. Hi Aaron - I should have thought this through earlier, but I have finally assembled some photos on a gallery page on my blog! I'm on this page looking for an alternative to pine needles. We've been laying pine needles in our beds for many years. We end up doing this twice a year to keep it looking "fresh". The reason I'm looking for an alternate type of mulch is SNAKES! At least once a year, I kill a copperhead in my pine needles. I live in a subdivision in SC. My neighbor has killed two so far this year. I've killed one. We both use pine needles. The copperheads blend in perfectly and they normally stay still until you get right up on them. I have dogs and I need to do something. I have a feeling that getting rid of the pine needles may help. I'm also thinking that the pine needles may be attracting palmetto bugs, too. Yuk! It's worth a try! Well, you could certainly try hardwood mulch. Perhaps the snakes and insects would find that denser mulch less appealing or think it offered less camouflage? More generally, I've come to believe that the best, most sustainable and long-term 'mulch' consists of groundcovers, preferably native groundcovers. Of course, finding the *right* groundcovers can be a major challenge in itself! I'm still working on that. Still, some of my current favorites - like Erigeron pulchellus, Packera obovata and Fragaria virginiana - probably would work as well in South Carolina as they do here in Tennessee! After having some tall pines felled on my property (over 40) and having all the branches run through a chipper, I have been using the resulting arborist wood chip mulch in my gardens. I have over 150 roses that LOVE it. It doesn't fly around like pine straw because the needles are chopped up and the wood chips hold everything down. It is excellent at weed suppression, keeps the soil moist (I don't have to water until mid summer), adds nutrients to the soil as it breaks down and I have worms in the soil now, where I didn't before. I was skeptical but now I'm absolutely sold. The difference in my roses was astonishing. Oh, and weeds pull out like they're in butter. Also, if there's a lot of rain or I over water, the wood chips absorb the water and hold it above the soil until it's needed. I love this stuff. And, it was free. Hi Aaron! I discovered your post while doing a google search for pine straw to spread out in a small area near my back yard patio as a "floor" for a small seating area. I live in north central Florida, in a yard full of pine trees. I tried using the needles last autumn, and they looked great, but break down fairly quickly, especially with traffic. I was unaware that copperheads like pine straw, as well as chiggers. Don't need any of that in my life! Thanks for the post, it was very informative. P.S. You commented on a plant in some part of your garden that you think is a wild geranium. I'm no specialist, really not even a gardener - just a homeowner trying to make the yard look nice. I've seen that plant in my lawn every spring and summer. Its a prolific weed with an interesting leaf shape, but never becomes something you want in your yard. I'm sure you've probably found that out by now but if not, I just wanted to let you know! Good luck with your mulching! If you have lots of pine trees on your property, it sounds like pine straw would be a great free source of mulch - especially if your property isn't a windy hilltop (like mine) where the pine needles are prone to blow everywhere. I also still feel like pine straw tends to swamp perennials more than other mulches, but again if you're just looking for a mulch beneath trees and shrubs, then pine straw might do the trick. I still feel green, living 'mulches' (i.e., groundcovers) are the best long-term option for blocking weeds, adding beauty to the landscape, providing wildlife services and knitting together a landscape bed. 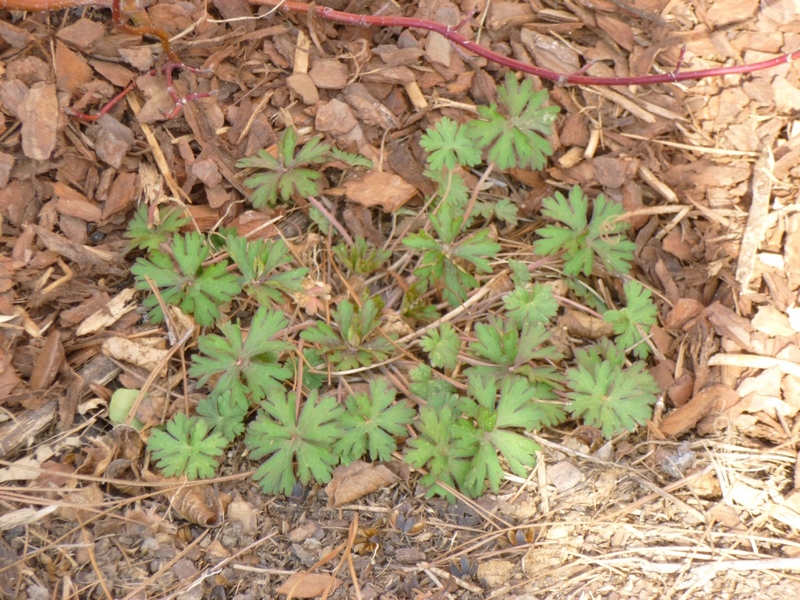 PS - I think you're right that the wild geranium I spotted that one time is indeed an annual weed (I believe it's Geranium carolinianum) - easy to pull, interesting leaves, but yes, too prolific and disappointing flowers. I appreciate the info! I moved to northern Arizona a few years back. I have been using decomposed tree nuggets like you now use. They look good, keep down weeds and most important in AZ keep moisture in the ground. I dont have to buy them, i just drive into the forest and find a decomposing log and fill up my buckets. Lots of Love in a Mist / Wild Geranium or Weed?